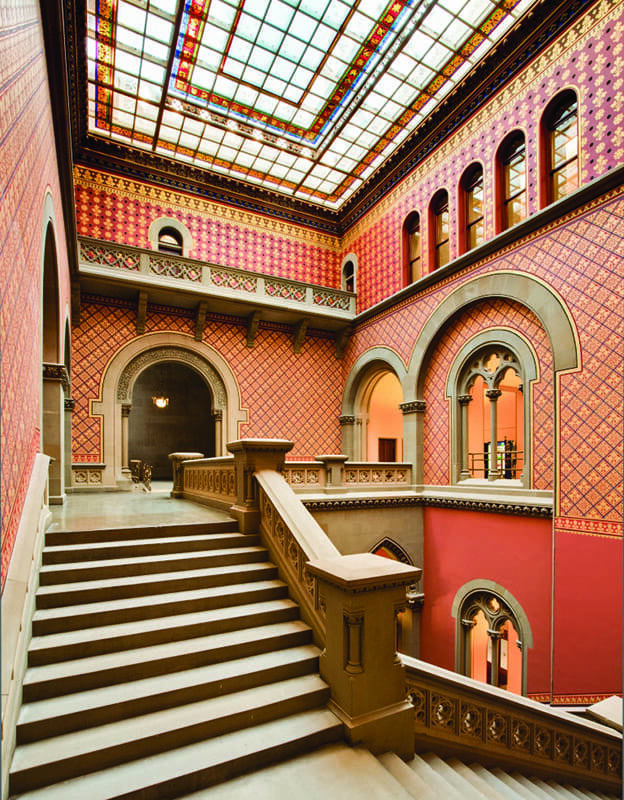 Gilbane’s construction management team achieved an accelerated construction schedule on this circa 1899 national historic landmark restoration project reducing completion timeline by 14 months by utilizing Gilbane’s schedule risk analysis process. 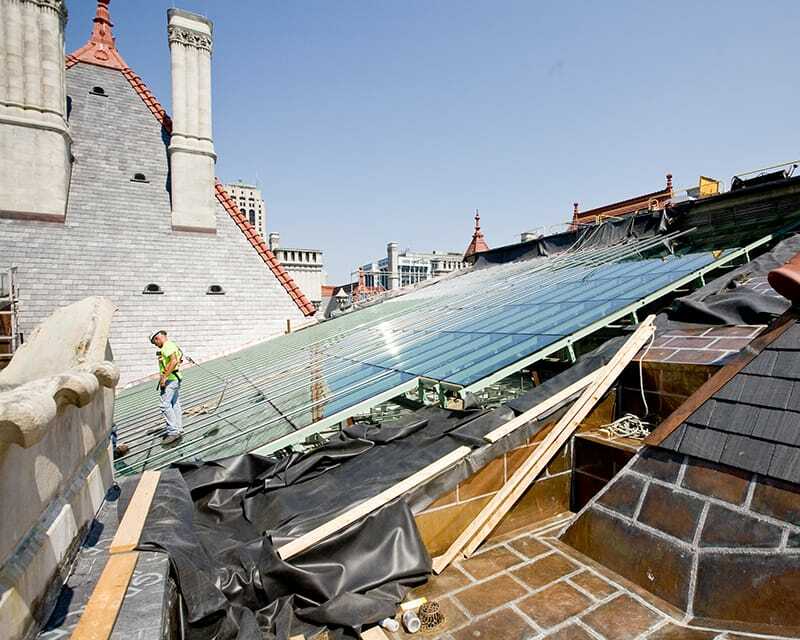 Gilbane provided construction management services for the New York State Office of General Services on this multi-phased restoration construction project of the historic NYS Capitol roof. The roof consists of an intricate network of roofing areas and systems including a large hipped slate roof with multiple granite dormers and four large granite chimneys, two smaller granite pyramid roofs as well as multiple smaller slate and built up membrane roofs with multiple dormers and penthouses built within. 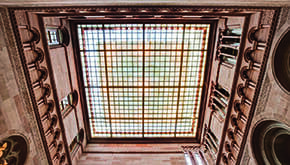 Restoration of two historic skylights and decorative art glass laylights located above the Assembly and Senate monumental stone staircases allowing natural light to shine on the staircases for the first time in over seventy years. Complete renovation and reorganization of the interior spaces. Relocation of the existing mechanical, electrical and plumbing equipment. The building’s existing egress paths on the fourth and fifth floors were significantly altered and updated to provide necessary accessibility and life safety upgrades. The Tower Hall area of the fifth floor was renovated to house a new office suite for the Legislative Bill Drafting Commission including a suspended mezzanine level supported from a newly installed roof structure above. Removal and replacement of approximately 2,500 pieces of architectural terra cotta. Installation of new copper flashings at all roof transitions and gutters. Extensive repair work to the existing building granite, slate repairs and the re-pointing of masonry joints. Installation of new lead coated copper flashing systems at all roof transition points including hips, ridges, valleys, gutters, etc. Schedule risk analysis services identified the critical path for client decisions and allowed the team to complete the project 18 months ahead of the original schedule. This saved the NY Office of General Services time and money while significantly reducing the impact to the Assembly and the Senate. The project was completed with an estimated $2.8 million savings to the taxpayers.